fruinergy Goji Antioxidants Natural Vitamin C is a nutritive complex associating two super-fruits: Goji (Lycium barbarum) and Acerola (Malpighia). Goji, from the Solanaceae family, is a red berry the size of a grape. It is used in Chinese Traditional Medicine for its numerous virtues. Acerola, a small berry from the Andes, naturally concentrates Vitamin C, a true antioxidant vitamin. 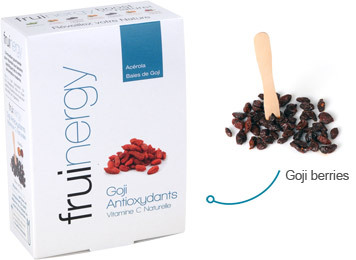 fruinergy Goji Antioxidants Natural Vitamin C contributes to protecting your organism cells against oxidative stress. fruinergy Goji Antioxidants is made with environmentally friendly techniques. Its carefully selected ingredients add up to a high quality product with authentic taste.